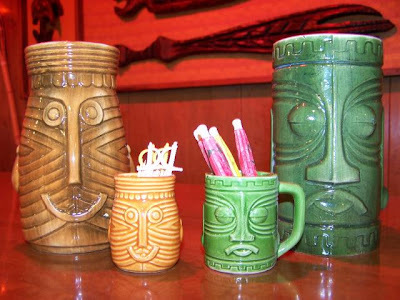 With the change in seasons and the mid-century blogs I read, I'm reading a lot about tiki these days. I only have one piece of tiki, a Westwood W-4 green tiki napkin holder that I bought at Goodwill for $2. We have a nice modern napkin holder that we actually use for our napkins, so this tiki head actually ends up holding our mail. He's perfect for either mail or napkins and looks great on our kitchen counter where he lives. Apparently, there's a whole line of this green tiki face. But tiki items are something of a slippery slope for me, I know that if I start collecting them, I won't be able to stop and my whole house will get taken over. So it's best that I just stick to the one.